Environ Ionzyme DF Machine Technology is used in ALL my facials. It’s increasingly recognised that the degree of success of even the best active skin care formulations is limited by the effectiveness of the delivery method into the skin. That’s why by harnessing technology that was previously used only in the medical world, skincare therapists are now achieving previously unheard of results with the right equipment. The machine enhances the penetration of topical ingredients through the skin’s naturally resistant waterproof barrier, resulting in striking improvements. 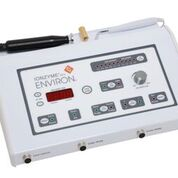 The Environ Ionzyme DF Machine is a patented system which uses a combination of low-frequency sound waves (sonophoresis) and a pulsed form of galvanic current (iontophoresis) to deliver key active ingredients (including high doses of vitamin A and C, antioxidants and hyaluronic acid) deep into the skin. Low-frequency sound waves are already proven in the medical world as an effective method for delivery of large molecules of drugs such as insulin into the skin, without the need for injection. Sound waves influence the skin structure temporarily to allow penetration of larger molecules that cannot be ionised by an electrical current. A process known as cavitation occurs, creating temporary micro channels in the skin. Environ was the first company in the skincare world to harness this technology. The system is designed for clients who are already using homecare products, but who want even more outstanding improvements to their skin. It is suitable for even the most delicate of complexions, as a highly effective skin nurturing facial, or as a course of intensive treatments for specific yet common concerns.